The information below can help those faced with recovering in the aftermath of Hurricanes Harvey, Irma, Maria, and Nate. 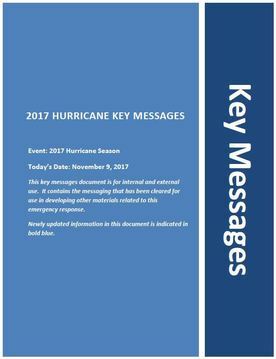 These key messages were updated November 9, 2017. Updates are in bold blue font. Updated information on the Strategic National Stockpile. After an emergency, federal, state, and local personnel will be working to establish debris-management programs, including household hazardous waste collection and disposal programs. These efforts may take days or weeks to come to all communities. In the meantime, exercise caution and report concerns to local environmental, health, and waste disposal authorities. Public health concerns regarding solid waste include aesthetics (e.g., the visual appearance of many collection sites and odors associated with solid waste), the potential for groundwater contamination, an increase in vectors (rodents, insects, etc.) that may spread diseases, and other issues regarding sanitation. Wear appropriate personal protective equipment (i.e hard hats, goggles, N95 masks, heavy work gloves, waterproof boots with steel toe and insole, earplugs, long-sleeved shirt, and long pants). Stay safe in hot weather by taking breaks in shaded areas, drinking water and nonalcoholic fluids often, and wear light and loose-fitted clothing. After a disaster, surviving rodents often relocate to new areas in search of food, water, and shelter. Removing food sources, water, and items that provide shelter for rodents is the best way to prevent contact with rodents. Where necessary, control rodents by using an integrated pest management approach that includes environmental sanitation, proper food storage, rodent-proofing, trapping, and poisoning. Keep food and water covered and stored in rodent-proof containers. A rodent-proof container is made of thick plastic, glass, or metal and has a tight-fitting lid. Keep pet food covered and stored in rodent-proof containers. Allow pets only enough food for each meal, then store or throw out any remaining food. Do not leave excess pet food or water out overnight. Dispose of garbage on a frequent and regular basis. If storing trash and food waste inside the home, do so in rodent-proof containers. Wash dishes, pans, and cooking utensils immediately after use. Remove leftover food and clean up any spilled food from cooking and eating areas. Do not store empty cans or other opened containers with food residues inside the home. When possible, use spring-loaded traps in the home and outside buildings. Use a small amount of chunky peanut butter or other available food as bait. (Remember – you are more likely to be successful trapping rodents if your home is free of other easily accessible food items.) Place traps in a “T” shape against baseboards or wall surfaces where rodent rub marks, droppings, or rodents have been seen. Keep children and pets away from areas where traps are placed. Glue traps and live traps are not recommended. 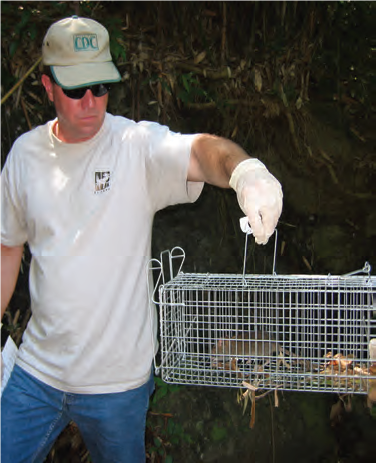 Glue traps mainly catch juvenile rodents, not breeding adults. Rodents caught in live traps and released will likely reenter the home. Dispose of debris and trash as soon as possible. Store woodpiles and stacks of lumber or other materials at least 12 inches above the ground and as far away from the home as possible. Store garbage in rodent-proof containers with tight fitting lids. Remove any food sources, including animal carcasses, that might attract rodents. Haul away trash, abandoned vehicles, discarded tires, and other items that might serve as rodent nesting sites. Keep grass short and cut or remove brush and dense shrubbery that may provide rodents cover and protection. Trim tree limbs or shrubs that overhang or touch buildings. Place spring-loaded traps in outbuildings and in other areas where signs of rodents are found. Do not allow children or pets to play near spring traps.